All paypal orders must include the 4.6% extra charge of the total cost as that is what paypal charges for it's service fee. My new book is now available for sale thru Amazon. Please click here to review it, purchase it or just find out more. Thanks! 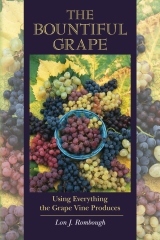 Successful Grape Growing For Eating and Winemaking by Alan Rowe. Please help support this site by purchasing it thru Amazon. This is a British book, so it's methods are for the English climate, and not suited to much of America. However, it also contains a lot of very creative greenhouse and pot growing techniques of grapes, as well as lists of cool climate grapes which many American growers will enjoy reading about. Included are a number of wine grapes, and some of the best of the old vinifera table grapes - ones of real quality and character that Americans don't see much of because the grapes have seeds. While some of the terms and methods may seem unfamiliar, it's written from the author's own experience, so it contains lots of bits you won't find in standard texts. All in all, this book is a worthy addition to the collection of any serious grape grower. Northern Winework is outstanding, not only for coverage it gives the growing of grapes in cold climates, but for the excellent descriptions of methods for vinifying hybrid wine grapes. Many of the cold hardy wine grapes make excellent wines, when handled properly, and Tom Plocher has considerable experience with them, which he passes along. Winemakers will find the winemaking information alone worth the book, and then some. There is also a section on breeding programs for cold hardy grapes, both in the U.S. and Canada, and abroad. And for those who know of Elmer Swenson and his cold hardy grapes, there are some very nice photos of him and his work in the book. Please click here to purchase it from the Northern Winework website.